Incepted in 1995, we are a fabrication firm engaged in the field of manufacturing & supplying premium quality equipment used in Chemicals, Pharmaceutical, Paints, Petrochemical, Food & Dairy, Cement and other allied industries. Our factory premises is spread over 800 Sq. and have concrete flooring with all facilities and modern machinery to meet the requirements within the stipulated time frame. Moving ahead with the pace of time, we have always emphasized on our research activities that has led to many product innovations. Empowered with two decades of experience, we have also successfully fabricated our equipment such as Pressure Vessels, Reactors, Heat Exchangers, Storage Tanks, etc. at many prestigious projects across the nation. Since our inception, we have constantly followed best quality standards and implemented innovative production techniques. Today we are certainly a trusted name when it comes to provide skillfully engineered products that improve productivity. Our commitment towards providing elite service and energy efficient products, has enabled us to achieve preferred supplier status with a wide other market leaders in this high growth industry. Within a short period of our inception we have gained huge client base and won the applause of esteemed customers at national platform. At R.S.Samant Eng. Pvt. Ltd., quality assurance has been our long tradition. 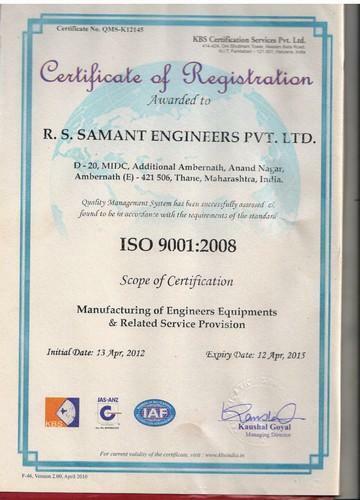 We give priority to our quality standards and use statistical quality control methodology as a management tool. Certainly through our perfect implementation of hazard analysis program, we ensure that our each product meets international quality standards. With a remarkable track record of providing best quality products, at R.S.Samant our endeavors are directed towards achieving the highest level of customer satisfaction. Being one of the leading names in this industry, we aim to stay ahead in competitive market and are committed to assist and serve our customers hassle free services in business market. Our Products with quality as our prime concern, we offer effective products to all our clients at competitive rates. Designed and manufactured as per international quality standards, we offer a wide range of components, which are widely used in various industries. The growing demand for cost effective product has been the driving force for us and to meet this objective, we have developed best production unit which is equipped with sophisticated technology. Our production unit also has 10 Ton EOT Crane with clear lifting height of 8.5 Mtr. At R.S.Samant Eng. Pvt. Ltd., we continually upgrade these machines to ensure that we always remain compatible with our customers' need & have the facility to accommodate big orders. Setting new standards of customer satisfaction, we are guided by Mr. R. S. Samant, who has 30 years of experience in the field of manufacturing chemical process equipments and execution of jobs at various sites. In addition to well defined infrastructure, we are also backed by team of experienced engineers to execute prestigious projects entrusted to us timely. Our engineers constantly provide the best design alternatives to give our client the right product and manufacture the product according to given specifications. Our highly skilled manpower constantly work for customer's satisfaction and also keep themselves abreast to the latest technologies in the market. Considering our manpower as our strength we also organize regular workshops to keep them well aware of the latest trends in this high growth industry.